This page is only for discussion of the Main Page. If you wish to discuss large changes to the RuneScape Wiki, please go to the Yew Grove. If you need help, please use User help or Administrator requests. This talk page is for discussing the RuneScape Wiki page. 16 Where did you get the background? 24 Saerch box has disappeared? 31 Do any of you read Runescape weekly update patch notes on a consistent basis? 37 No more search bar? What do you think of the revamped runescape.com site? Something that would be very helpfull under every item overview (members only: yes, high alch: 100, Quest item: no, etc..) would be implementig a space where someone can see if the item, upon death will be kept in inventory, respawn at death spot or lost. Example: a wicked hood, upon death cannot be picked up at deathspot, a talisman staff can. Many people would liek to be aware of what happens to items upon death. —The preceding unsigned comment was added by 190.241.74.9 (talk) on 19:26, 9 May 2012 (UTC). There isn't an "I don't like it" option, only positive or no opinion. I don't like it because I didn't make spelling mistakes often enough for it to slow down my browsing, and even when I did it just takes me to where I get now. —The preceding unsigned comment was added by 50.42.18.109 (talk) on 02:19, 15 May 2012 (UTC). Ugh, I'm sorry. Don't know how on Earth I missed that. —The preceding unsigned comment was added by 50.42.18.109 (talk) on 19:57, 15 May 2012 (UTC). RE: Could you please add to the wikia the General store prices of items! As well as the purchous limit at the GE. I use the GE to buy items and then sell them at the General store. this would be very helpful for me. and the purchous limit could help me know what items to buy and trade to other player because of their higher street prices! —The preceding unsigned comment was added by 121.218.118.196 (talk) on 08:51, 19 June 2012 (UTC). Auto search no longer works, e.g. the feature that (used to) work like Google suggestions. I noticed a post about this but I couldnt find it, something about creating an account and changing a preference option. I did this but it didnt fix it. —The preceding unsigned comment was added by 81.108.179.156 (talk) on 12:57, 6 July 2012 (UTC). Personally, I'm against the aspects of the SOF and the Solomon's Store that give your character real, non-cosmetic benefits in the game in exchange for more actual RL money. However, this isn't because I think it violates Jagex's own RULES - after all, is Jagex selling membership RWT? Of course not! I think its because it 1. Hurts the game, 2. Violates the PRINCIPLES that jagex used to have and 3. Is a slap in the face to all those who play Runescape loyally but are getting a disadvantage because they aren't willing to pay MORE money than they already do. So I think there should be another section to the poll - "I'm against it because I think it hurts the game and the principles that Jagex once had" or something to that effect. —The preceding unsigned comment was added by 72.225.170.133 (talk) on 02:26, 16 September 2012 (UTC). This game is going to die sooner and you all know it, it got destroyed by money hungry investors. Could we get rid of the Scarlet Blade (or whatever it is) advertisements all over the website? They're just... wrong, and frankly offensive. Use the "email this user" on en:WP. The Wikia refuses to actually send confirmation to activate my mail link on here. Rich Farmbrough, 21:00 9 October 2013 (UTC). Date Issue in Runescape News Section. Apologies, but as i am not an active member on the forums, and as such, had missed the oppritunity to voice my opinion before the change was implemented (and it seems i am not the only one who is in the same situation). The day that the change was made, i had attempted to contact someone about such (Coelacanth0794) , to help voice my opinion, as i was unable to find a subsequent "reaction poll" to the change, aside from the one shown above. Following that, i had seen the poll mentioned above appear, and had thought that it was to be the "reaction poll" that would effect the changes made, This ended up giving me some false hope of a change being made, and as a result, i did not persue the topic in a more timely manner. 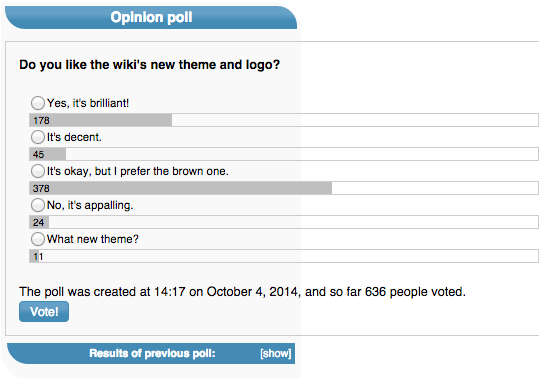 (I waited untill the previous poll ended to see if a change would be made, thus the "late opinion"). I feel that the previous "choose a theme" poll was not as commonly known to a large percentage of wiki users, and as a result, may not have accurately represented the majority opinion, and am asking that there be a revisit on the option, as there seems to not have been a forum post follow-up (Had there been, i would have voiced my opinion there, or on the original poll, had it not been locked the moment the change was enacted). Hmm... OK I have found it. —The preceding unsigned comment was added by 86.101.197.98 (talk) on 06:57, December 4, 2014 (UTC). The order of the 'Patch Notes' has 9 Feburary after 2 Feburary. For example, Dishonour among thieves has hidden reward chests and additional rewards post-quest. Another example is Myths of the White Lands, which gives us more hidden rewards. The reason I'm asking this is because that is a LOT of xp strewn through out the game, and there is no page that collects all these additional and hidden rewards. I don't know the total exp from this, but some go up to 50K. Another page is daily collections. Things we can gather daily or do daily, for example D&D's and task rewards. I'd love to have this page especially as it gives me a to-do list for runescape everyday. —The preceding unsigned comment was added by Derigar2 (talk) on 5:14, February 27, 2015 (UTC). Any chance of changing the current blinding blue/white theme? It's really bad on mine and maybe a lot of other peoples eyes? Would be a huge plus to have an option for a dark theme for people with eye problems or just for night time viewing in general. You may remember the voting for couples across wikia communities last year, and it's back! Vote at Greatest Love of All Couples Bracket Returns! (on the community wiki) for you favorite characters! Was SERIOUSLY surprised to discover that there (seems) to be no "Daily Free Resource" article. Some to tell about all the free Flax, Sand, Pineapple, etc. Things in the PoH, Around Geilinor, etc. I'd create one myself, but I rather strongly suspect I only know about the ones EVERYONE knows about. Perhaps a Calculator of some sort to suggest a route depending on what resources were/weren't wanted? Great site. —The preceding unsigned comment was added by NFReditor (talk) on 08:06, 18 March 2018 (UTC). The search bar is gone from the top of the pages? Now all I see at the top of the page is a Fandom menu that disappears when I scroll down but there is no more search bar. —The preceding unsigned comment was added by 99.255.154.116 (talk) on 00:30, 11 July 2018 (UTC). Thank you for your help. Feel like an idiot not...lol —The preceding unsigned comment was added by 99.255.154.116 (talk) on 16:45, 11 July 2018 (UTC). application recources is not loading, is this because of the update? —The preceding unsigned comment was added by 87.211.168.64 (talk) on 11:27, 8 October 2018 (UTC). I haven't played in about 7 years and this is all new to me. I am looking for the enchanting spell and can't find it. Help would be appreciated.. —The preceding unsigned comment was added by Bigslickone (talk) on 14:56, 22 December 2018 (UTC). in the new format i am unable to find the enchant dragonstone ring —The preceding unsigned comment was added by Bigslickone (talk) on 15:42, 22 December 2018 (UTC). 2/22/19 today's poll has no vote button. Since I'm new here (because I wanted to tell someone) I havn't really learned the ropes when it comes to adding features to existing content. Someone much more savvy than me should maybe look at that? :) Happy double xp-ing! —The preceding unsigned comment was added by Technomore (talk) on 16:41, 22 February 2019 (UTC).